Royal Swans or Ugly Ducklings? 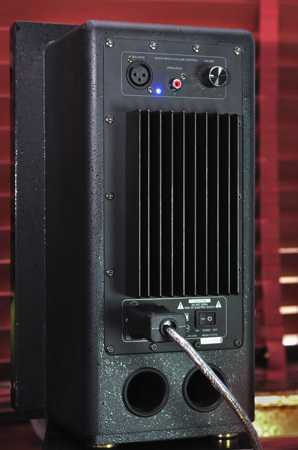 A little while ago I reviewed the Epoz Aktimate Maxi all in one "powered" loudspeakers. They were very flexible and a fairly good sounding set up but I did bemoan the fact that they weren't "proper" actives with an amplifier for each speaker. Next thing I know I get an offer to review a pair of active speakers with one amplifier for each cabinet. OK, this may still be one step short of the ideal of one amplifier per speaker driver but it should be a step up from a single amplifier for the pair. The speakers under consideration are made by a Chinese company called Swan. Swan is developing a reputation for building good value speakers as well as manufacturing drivers for other mainstream brands. I'd heard and been impressed by a couple of their models at the Whittlebury Hall hi-fi show, so was keen to see how they'd perform in a domestic setting. There are certain advantages to active speakers, not least the fact that you don't need to buy a separate amplifier. And the amplifier can be optimised to drive specific speakers, rather than designed for general purpose use. It means no speaker cable - which is cheaper and removes a potential weak point in the signal chain. It does tend to mean longer interconnect cables but since these speakers are intended primarily for near field use, then one to two meter interconnects should be fine as long as you can site your source between the speakers. There are downsides to actives too. You'll need two power cables. They are limited in terms of inputs compared to most pre-amps or integrateds. These speakers have two inputs, one RCA and one balanced XLR which could be an issue if you have multiple analogue sources, although, if using a DAC with several inputs, you could always perform the switching at the digital stage (which would give a better sonic result anyway).The manufacturer's photographs show the speakers on a desk beside a PC which may be fine but I suspect they'd do better on stands away from rattling pens, mice and other desk based life forms! That is how I tested them - in a room about 5m x 4m. 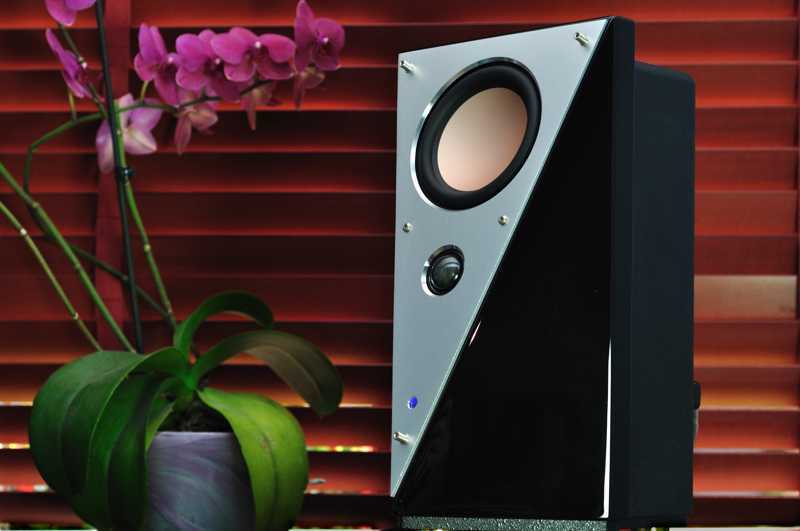 The T200B is a two way active monitor speaker rated at 40w per channel. In a strange mixture of measurements, the magnesium bass/mid driver is described as 5in and the tweeter 28mm. Looks are angular, slightly futuristic and said to be designed with function in mind. Materials are described as low resonance and there was no excessive ringing when given the "tap" test. The speakers are configured with the woofer above the tweeter, the sloping front said to be designed to align timing between the drivers. The angular structures should reduce standing waves and the impact of the cabinet in the room, although I've reservations about whether sloping fronts really make a lot of difference. The cabinets are sturdy and the connectors on the rear are of good quality. They come in a well executed piano black finish on the front sides with an inverted triangle of aluminium housing the drivers themselves. The cabinets have two small round vents on the rear which allow for a little bass reinforcement if placed near a wall. Foam plugs are provided to so that the use of the ports can be tailored. The speakers sit on three plastic feet wrapped in a gold metallic finish. The overall effect is one of solid, well made and finished kit. The appearance, however, may not be to everyone's taste. Initially I didn't like the look of them at all but they grew on me after a while. They are not a regular box speaker. The rear section is an oblong box slightly shorter and narrower than the front section. This rear section is of dark gunmetal, overlaid with a black speckled paint finish. The front section consists of an inverted equilateral triangle of aluminium flanked by two black right angled ones in the piano black finish. The triangular face and blue LCD on the front gives the whole thing a futuristic look. To my eye they looked better with the covers on and this didn't seem to have a major impact on the sound. Seemingly in common with everything else I've reviewed recently, the remote control is a bit quirky. It looks smart, in decent quality black plastic, with a small LCD screen showing the overall volume level as well as that for each speaker. I initially had trouble getting it to adjust the volume consistently. I later realised that there is a delay between pressing the buttons and a change in the parameter being controlled. Once I'd got used to it, it was fine, especially since the blue LEDs on the front of the speakers change to red when they are receiving a signal from the remote. Each speaker can be controlled independently giving a high quality balance control. I know balance controls receive a bad press but they can be useful if it is not possible to site the speakers optimally or if there is an imbalance in the source material. For my testing I paired the speakers with a Cambridge Audio DACMagic fed from an Asus Essence STX soundcard housed in a Windows 7 PC. I normally listen to that PC through a homemade "gainclone" amp and floorstanding Acoustic Energy AE509 speakers. The difference with the Swans was immediately evident and pronounced. Even though the metal drivers of the Acoustic Energy are fast and accurate they sounded pretty laid back compared to the Swans. The Swans had what I think of as a more modern sound. My first impression was that they were very crisp, clean, and open sounding. Fed plenty of detail from high definition files from the PC and DAC it didn't seem that anything was getting lost. The detail and time coherence meant that imaging was very good. The sound was tight, with leading edges well defined and an impressive dynamic range. They sounded like they wanted to jump out and get you but once they had, they were subtle enough to impress with low level detail and a good grasp of the inner workings of the music. On the face of it the only fly in the ointment was likely to be the bass response. This is rated at 6db down at 55hz. In fact the supplied frequency response curve shows a fall off starting at around 110hz. This is fairly typical for a standmount but normally means the sound is lacking in power and heft. I was surprised then that with quite a smooth fall off the relative lack of lower frequencies didn't cause a major sonic issue. Of course this may partly be because the speakers matched the listening room well and the room itself could be reinforcing some of the lower frequencies. The bass that is there is clean and fast and it's not immediately evident that anything is missing. Occasionally I did get the feeling of wanting to feel a bit more air movement but this was quite dependent on the material. It could also make the sound a somewhat cool, introducing a little hardening on string parts for example. Taking the Boston Symphony Chamber Players 2003 recording of Mozart's Chamber Music for Winds and Strings, the clarinet and woodwinds seemed to benefit from the speakers' superbly detailed presentation but the strings were a bit cold by comparison. Having said that they never sounded harsh or forced. In many ways it had a strong resemblance to headphone listening - you can hear the bass notes but they don't work in the same way. I noticed it more when I ran the A/B comparisons with my usual system in that room. When I'd first switch, I'd welcome the warmer bass presence but also notice that the AEs sounded muddy in comparison on the vocals and percussion in particular. As ever, there are compromises, nothing is perfect. The speakers are connected to the mains supply by figure of eight power cables. The UK distributor, Item Audio, supplied a pair of their own brand premium power cables with the speakers. These did bring a slight improvement over a regular generic cable, suggesting the speakers will be sensitive to the quality of mains supply. The effect was one that I came to recognise when playing with mains accessories for other reviews recently. Basically, it can deliver a slight easing of the sound making it just a fraction more natural than with a more basic supply or cable. As with other matters related to mains supply it's worth checking whether they make any difference in your system before shelling out money for them, but they definitely can make a difference. Half way through the review period I was abroad for a couple of weeks and didn't listen to any hi-fi while I was away. The Swans were the first system I listened to when I got back. I was stunned at how good they sounded. Since my ears were no longer comparing them with more expensive reference systems I was able to take in just how good they are on their own terms. The speakers created a really stable and clear stereo image with depth as well as breadth. The tone is crisp without being harsh. "Engaging" is the word I kept coming back to. Listening to the Jimi Hendrix classic Little Wing, for example, I was struck by how the glockenspiel rings out alongside the guitar in the introduction. Still on a guitar theme, well recorded acoustic instrumentals sounded wonderful. Tommy Emmanuel's "Only" album and Michael Hedges' "Beyond Boundaries" are both good albums for testing reproduction of this instrument and these speakers passed with flying colours. Piano also benefitted from the fast transient response and dynamics - a reminder that piano is, after all, a percussion instrument, although the recessed bass frequencies meant a certain richness was lost. Here are a few of the impressions I gained on a range of different material. Seal - Future Love Paradise - the speakers are making a good job of separating the strands of the vocals whilst retaining coherence. The bass track is clear and present but a bit lacking in impact. That headphone effect again. Crazy - catches the rhythm nicely - interesting to hear the detail in the phased vocals and synthesisers well defined. Kate Bush - 50 Words for Snow. On the track - Misty - good imaging - subtle drumming sits back in the mix, clearly behind the piano in a 3d image. Breathy voice well formed. Max Richter - Blue Notebooks. A good album for the way it blends a wide range of instrumental sounds and sound effects. Swans handled with ease. Separation of the spoken voice and typewriters in the first track. Beautiful rendering of the piano and strings. Good detail in synth sounds notable again. Sonny Rollins - St Thomas - 96khz hi rez download - great singing saxophone. Crisp cymbals - brings out the dynamism of the drumming. Bass maybe a bit recessed. Meditation - Choir of St John's College Cambridge - vocal lines clearly distinct - a bit dry. Madelleine Peyroux - The Kind You Can't Afford - you can hear hum of guitar amplifier well enough to associate it with the wah wah guitar (the main guitar track seems must have better noise gate!). Bass guitar works well - driving the track along. Maeve O'Boyle - Facing Home - lovely clarity and air around the voice. You can really hear the detail of the vocal reverb receding in the soundstage. Maybe a bit lacking warmth compared to AE. You probably realise by now that I came to rather like these speakers. Although not cheap, to my mind, they offer reasonable value given that there is no need to buy a separate amplifier and the sound on offer is always good, sometimes spectacularly so. Although they are less well equipped than the Epoz Aktimate Maxi, they produce a more stable and accurate soundstage and offer a more dynamic presentation. Bass is a relatively weak point although no more so than most speakers of this size (and price point) and the bass they put out is well controlled and effective. Having said that, the Epoz was overall a warmer sound if less striking in quality. Potentially you could add a subwoofer to the Swans for very high quality system for a small or medium sized room, although you would need to find a way to break out and control another channel for the sub (there is no preamp out). While at the Whittlebury Hall hi-fi show I also heard these speakers filling a very large room, so there is no doubt that they will go loud. Having said that, their strengths are in the imaging achievable in near field listening. All in all they make a very good case for the benefits of active speakers in that type of implementation. In the UK, swans are most highly regarded birds. As a result of ancient laws, the Queen of England is said to own almost all of the swans in the country and to kill one is still viewed as treason. Until 1998 it even carried the death penalty (well, in theory anyway)! OK, so maybe these Swan loudspeakers aren't quite sacred birds, but they might just be the next best thing.